Allows to set the voltage applied to different sort of loads like Resistive, Inductive. Small Housing. Easy and ready to use. 6 SCR Phase angle control for star and delta 3 SCR 3 Diode. Fully opto-isolated full cycle three phase angle controller. Input Output transfer characteristic linearization function (Resistive load). Integrated heatsink and fan for force cooling for higher ratings. 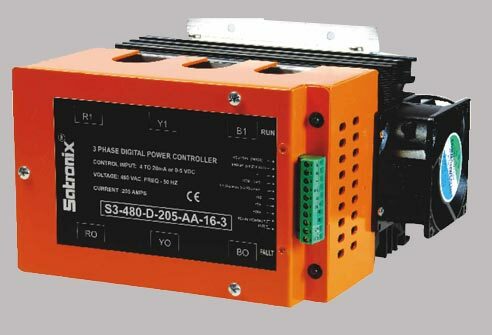 This model is 3Ø phase angle power controller with 6 SCR for Star and 3 SCR, 3 diode for Delta phase angle control. It linearly controls RMS load voltage with respect to control signal. This model is available with current rating from 50 to 90 amps. 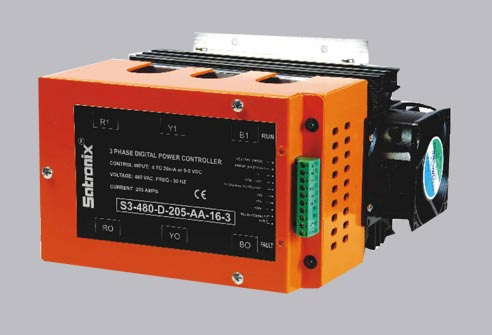 It is useful for transformer coupled loads, fast responding loads and non linear loads. Fuses Semiconductor fuses are recommended. Fast acting electronic fuses protect control transformer. Semiconductor fuses for thyristor protection.